Greetings from sunny Roswell New Mexico! Plans for the 2008 Roswell UFO Festival are well underway, and many of the details are firmed up enough to share, with still more being finalized. 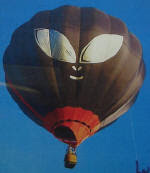 "Some of the events planned for the 4-day gala are an alien village at DeBremmond Stadium, entertainment by the vocal group UFOetry at the Convention and Visitors Center, an alien encounter haunted house, a light parade down Main Street, the Fourth of July celebration and the showing of the 1994 made-for-TV movie, "Roswell." The UFO Museum will also be planning events July 4-8 and most likely speakers as well, but no info is yet available on their website. For those interested, I've also added the text of the 1947 Roswell Daily Record UFO articles to this website in case you've never actually read them, as well as a link for purchasing souvenir reproductions directly from the RDR. Happy spring to you, and hope to see you this summer!